The USS PONCE (LPD-15), an Austin class amphibious transport dock, was commissioned on 10 JUL 1971. 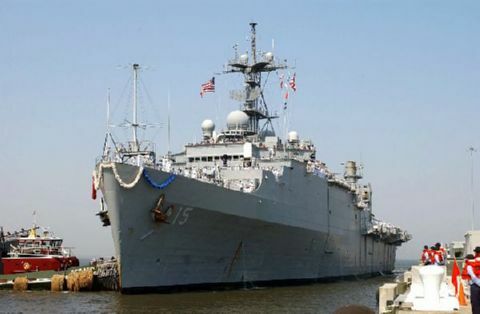 Built by Lockheed Shipbuilding in Seattle, Washington, USS PONCE has spent her entire career operating from her homeport of Norfolk, Virginia. PONCE has deployed numerous times to the Caribbean, North Atlantic, and Mediterranean. PONCE is no stranger to transiting the Suez Canal and extending a "MED" into the Indian Ocean and Persian Gulf. USS PONCE, true to her motto. "The Proud Lion, stands ready to answer the call as evidenced by her shift from the Indian Ocean to the Gulf of Sidra during the Libyan Rebellion of 2011. Ponce was laid down 31 October 1966 by the Lockheed Ship Building Co., Seattle, Wash.; launched 20 May 1970 sponsored by Mrs. John J. Hyland and scheduled to commission in July 1971.